A whole-school approach to integrating online safety across the curriculum in your school. 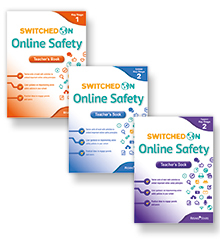 Switched on Online Safety is a new resource which will be a valuable classroom addition, it is one of the most comprehensive resources covering the key and vital aspects of online safety for students. Lioncrest Education is proud to bring this resource to New Zealand schools. Empower children to become positive and responsible digital citizens. Embed robust online safety principles into your existing lessons with interactive, cross-curricular activities. Engage parents with online safety principles to ensure best practice extends beyond the classroom. < NEW! The Secret Lives of Insects. Great for reluctant readers!